Summary: 17-year-old Annika tries desperately to get TV-star Steve Raleigh, of Teen Robin Hood fame, to visit her six-year-old brother, Jeremy, before the brain-tumor surgery that may or may not save his life. Despite the circumstances, madcap adventures abound: Annika’s attempts to infiltrate the Burbank studio set during the filming of the show, disguised as an animal handler with a huge snake, are predictable but delightful. Her initial reaction to Steve is distaste and disgust—which means that soon enough they are a romantic item. However, what drives this story is not their romance, but rather Annika’s love for her little brother and the courage she displays as she tries to save him. The sibling relationship between Annika and Jeremy is both believable and heartrending—get out your handkerchiefs! My Thoughts: This book was one of those feel good sweet reads! We meet Annika who loves her brother so much that she will do anything for him! She went and stood in line just to get a Teen Robin Hood action figure than come to find out her brother would rather meet the real one! Her brother is ill and she wants him to have what he wants. But most of all, she wants him to get better!!! So Annika drives to the studio where Robin Hood aka Steve works and tries to convince him to come home with her to meet Jeremy. She meets Steve and I basically laughed out loud, you will have to read it to know what I'm talking about. But she has to find a way to convince him to come home with her so she starts doing all kinds of crazy things to get in to meet him. This is the kind of book we will all enjoy. You know if you had the chance to meet a celebrity you'd take it even if it was for a sibling. And to come to find out the celebrity is actually pretty hot! This was such a cute and enjoyable read. Its laugh out loud funny and sad at times you will want to cry. Overall: Funny, sad, tears, laughter. Cute book! Cover: I this this cover is pretty. I especially like how we can tell she is blowing on the flower maybe making a wish? Artistic and pretty. Looks good. I Can`t wait to read it. I like the cover too! Very cute, but simple. I love Janette Rallison, all her books are gold. 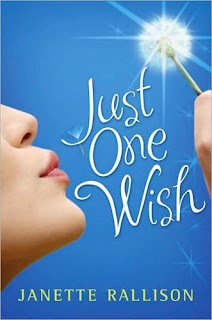 I really loved Just One Wish, wouldn't it make a cute movie? Glad you enjoyed it, good review! I like the cover too. Tears, sick brother, uhoh, sounds like you need a box of tissues to read it. oh man, I totally need to read this book now! I really liked this one. Great review.